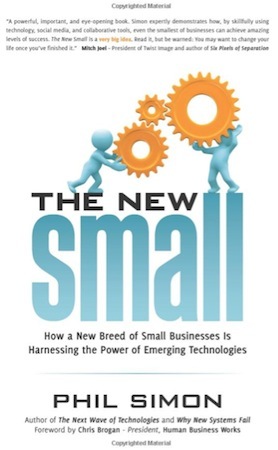 I recently completed Phil Simon’s book the New Small, which is focused on the success characteristics of today’s small businesses. So much is written about large companies (or small companies that have successfully become large). But there is very little written about small companies that are still small. Although the book focuses on small companies I think it is the big ones that should be reading it. These smaller companies are leapfrogging big companies because they are able to adapt to change faster. And they are out-recruiting big companies for the most creative and technical talent because of the employment promise they can deliver. Long Term Greedy – These employees are not beholden to quarterly earnings announcements. Instead they are free to make decisions that are in the long-term best interests of employees, partners, customers and themselves. For example they are willing to turn down work that does not make sense for their customer. Cautious Growth – Many of these companies choose to be great instead of big. They realize that getting big runs the risk of undermining the culture and jobs they worked so hard to create. Willingness to Experiment – These companies are not afraid to experiment with new technologies, business directions or vendor relationships. If a tool is not working for the company then they simply try another – sooner rather than later. Unwillingness to Reinvent the Wheel – New Small companies would never dream of writing their own software. This is in stark contrast to large organizations. Simon uses the example of Merck building its own ERP system, which he compares to IBM inventing its own aspirin. Desire for Something Else – The employees at these small organizations intentionally left traditional jobs at larger organizations. They knew the downsides of working for corporate behemoths.